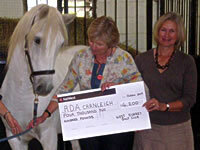 Cranleigh RDA is a not-for profit organisation. We do not receive any funding from national or local government sources. If you would like to send us a donation you can rest assured that every penny will go towards our operating costs taking care of our ponies and other necessary operating costs incurred to give our riders every opportunity to realise their potential. Whatever you donate, large or small thank you – it all counts and it all helps. Once we have the completed form we can then claim an extra 25p from the UK government for every £1 you give. If your employer, company or personal pension provider runs a Payroll Giving Scheme, you can donate straight from your wages or pension. This happens before tax is deducted from your income. Ask your employer or pension provider if they run a Payroll Giving Scheme. Leave a Legacy and help us change lives. Maybe you have direct experience of how Cranleigh RDA changes lives, or maybe you want to do something amazing to help others. Either way, remembering Cranleigh RDA in your will can make a real difference. A legacy for Cranleigh Riding for the Disabled Association Group will help to ensure that future generations can benefit from the therapy, achievement and enjoyment of riding. For further information and advice about remembering Cranleigh RDA in your will, contact us for more information. If you would like your donation to be for something specific, please contact the Chairman to discuss our current needs.